The most beautiful place for a hanging chair in your own garden. What a feeling, when the sun is shining and you can let yourself go with a cool drink in your hand while gently swinging in a swing chair. However, if you want to buy a swing chair for outdoor use, you should consider a few things. Here we will explain which hanging chairs are particularly suitable for the garden, where is the best place to hang it, and what else to look out for when using a hanging chair outdoors. All hanging chairs made of some hard material, in which you can sit upright, and lean back like in a normal classic chair, are called- hanging basket chairs. 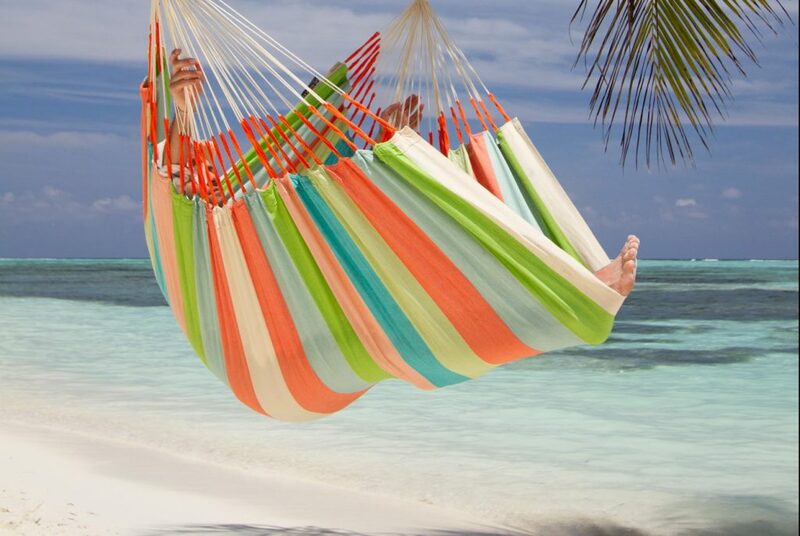 All hanging chairs made of some kind of fabric, rope, or netting are called – hammock chairs. 3 What models are durable outdoors? 4 How to Hang the Chair Outside? The hanging basket chair is, like its name says, a hanging chair that is weaved like a basket and looks like a basket. They look great and make every simple apartment and every simple terrace a special and stylish area to relax. But what is so special about the braided hanging chairs? According to Wikipedia, a basket is a container which is traditionally constructed from stiff fibers, which can be made from a range of materials. And the technique for making products woven from any one of a variety of materials is called wicker. Wicker is light yet sturdy, making it suitable for items that will be moved often like porch and patio furniture. A hanging wicker chair is thus woven from strong but flexible materials. But what kind of materials are these? Rattan, or more recently the very popular artificial variant, the so-called Synthetic Rattan, is at the top of the list for wicker hanging chairs. Probably the most important question when choosing a hanging basket rattan chair relates to the material: Should I buy a natural rattan swing or a plastic imitation? We will answer this question briefly. The main advantage of natural materials is that they look more chic and high-quality, and also feel more valuable. Although, we advise synthetic rattan for outdoors. The natural rattan looks much more beautiful, indeed, and that’s why it perfectly fits in your bedroom or living room. The disadvantage is that natural materials are usually more expensive than the plastic versions, and the most important factor for not choosing them for outdoor use – they are not weatherproof. So if you want to buy a hanging basket chair for the terrace, balcony or garden, a basket made of polyethylene (PE) or another plastic imitation is the better choice, because it is much more durable and does not have to be covered or brought in when it rains. However, if you are looking for a really high-quality outdoor hanging chair made of natural material that feels great and simply looks more expensive, then hanging chairs made of wood are the right choice. But you have to accept a slightly higher price in that case. 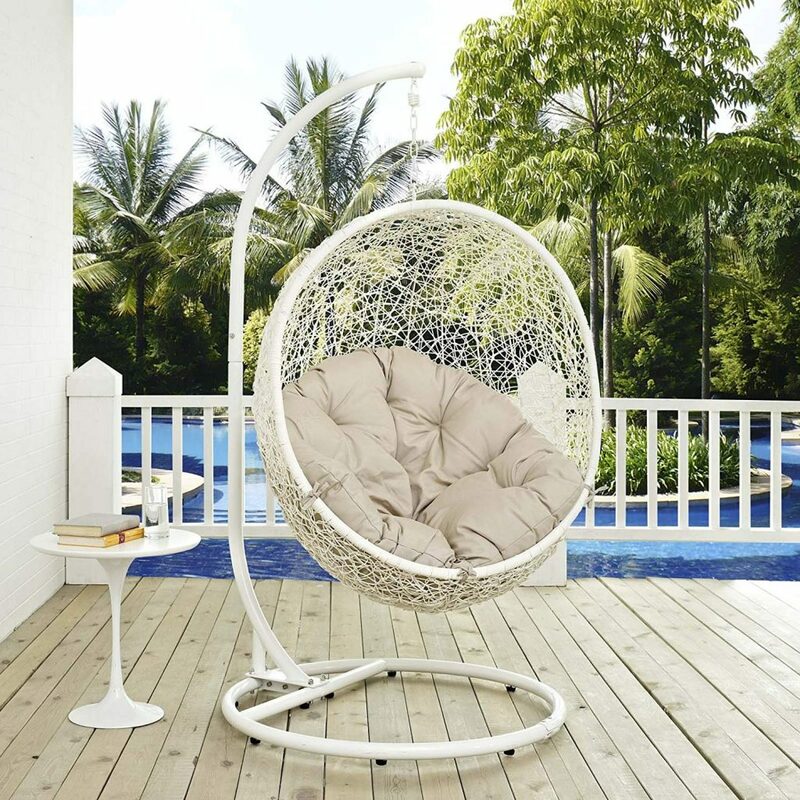 In addition to the wide selection of rather inexpensive, classic hanging chairs made of synthetic rattan, some manufacturers also sell the hanging chairs made of wood, which is definitely a luxury outdoor hanging seat. The best-known wooden models, which can also be bought online, are probably the Globo Chair and Double Globo Royal by Byer of Maine. The Globo Chair is made of weatherproof treated spruce. The hanging chair is padded with thick cushions that guarantee you’ll have a comfortable seat. Even if the Globo could bear the weight of two rather light adults, its dimensions are simply too small. If you would like to buy a bigger model, take a look at the Globo Royal. The Globo Royal can carry up to 200kg and offers more than enough space for two people. 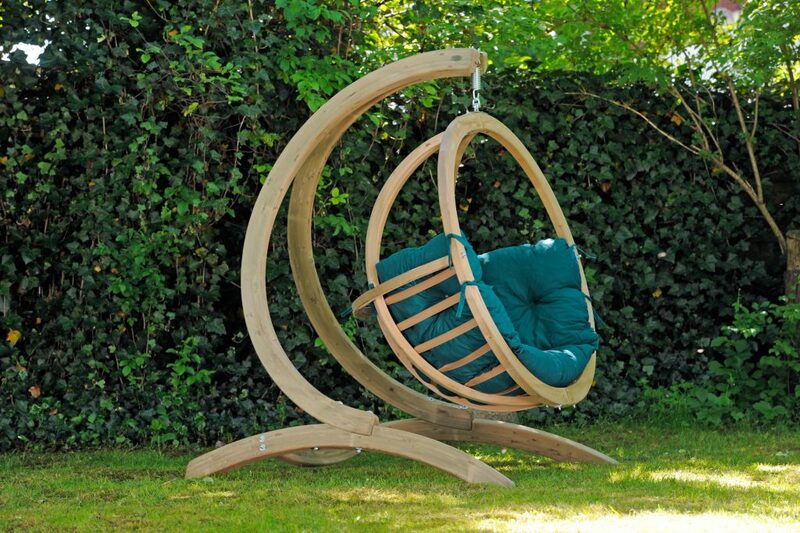 The Globo Royal is not a simple outdoor swing chair, but rather a wooden hanging lounger for the whole family. We recommend he matching Globo Royal Stand. It is handcrafted and, like the accompanying hanging lounger, consists of a layer-glued construction of weatherproof spruce. 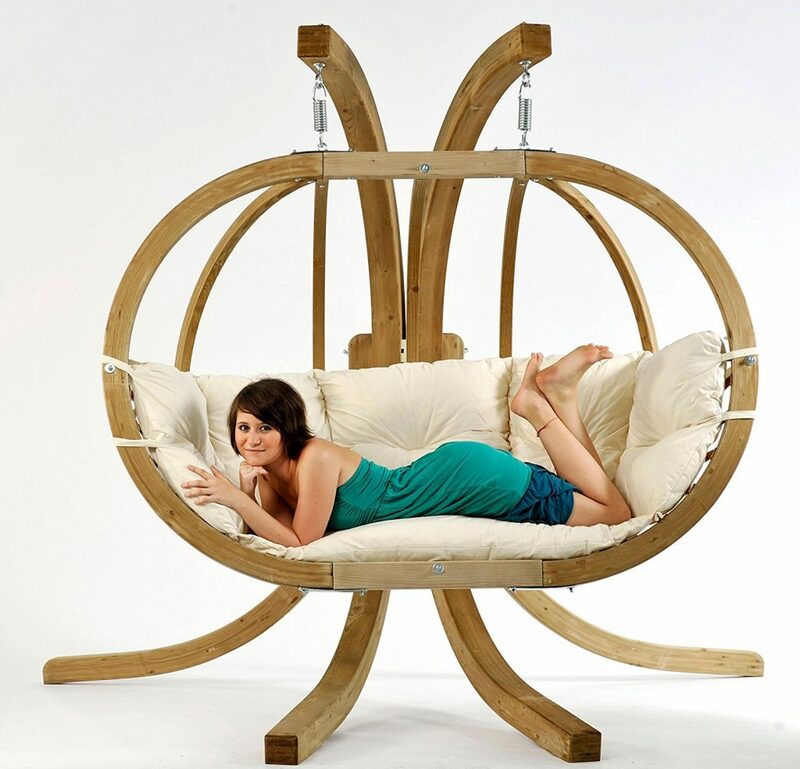 Hanging chairs made of wood are a great thing and a real luxury piece of furniture for your garden. They are of course much more expensive than the classic hanging chairs made of PE. However, those who always place their wooden hanging chairs under a shelter in winter and do not expose them to rain too often will enjoy the high-quality models we have presented to you here for many years. Since a hanging basket doesn’t fit your body like a hammock hanging chair made of cotton, you need to make sure it is big enough so you can make yourself comfortable. Look at the model of your choice to see if you can sit upright in it. If you buy online and can’t try it out on the spot, almost all models show the height of the basket (if it’s closed at the top). It is best to briefly measure the height of your upper body while sitting and compare the two values with each other. Also to the left and right you should have some space to make yourself comfortable with some cushions. These tend to be simple, informal, and very affordable. They’re also airy too, so they’re great for the outdoors during the summer season. The breeze will feel great, and the cool feeling will help you feel relaxed and stress-free. In this type of hanging chair, you have ropes tied and woven together so they resemble some sort of netting. For greater comfort, many models are made of cotton or polyester instead. Some are even made of tough duracord. The rope hammock chairs generally have a spreader bar so that the netting is spread out. This makes it easy for you to take a seat right away and also keeps the netting from trapping you up inside. The downside to the rope style is that the holes can create unsightly patterns on your skin when you sit on them for too long. They’re also not quite all that comfy, compared to other hammock chair styles. Also, your fingers can get caught in the holes as you move your hands. Many customize these hanging chairs by using blankets, cushions, or pillows on them. These rope hanging chairs can be made from many different materials. Cotton Rope Hammock Chairs: This is one of the most commonly used materials for a variety of reasons. It’s very economical. It’s also the softest material you can use for rope-style hanging chairs. It can conform to the shape of your body very well so you feel quite cradled as you relax and take a seat. On the other hand, cotton ropes don’t really last for a very long time. You may also want to keep them from getting wet, as it takes a while for them to dry out. Polyester Rope hammock Chairs: This works very well with rope hanging chairs, although they may be a bit more expensive than the cotton ones. Many manufacturers use soft spun polyester so they’re also soft, but they’re more longer-lasting than cotton rope. Polyester even dries faster than cotton. As a bonus, they’re also resistant to mildew and mold. Nylon is soft, very light in weight, and quick to dry. It’s just that it’s not quite as comfy as cotton. Duracord Rope Hammock Chairs: This is perhaps the strongest of them all, yet it is soft too. It balances the softness of cotton with the durability of polyester. It’s resistant to stains, mold, and water. Even if it gets wet, it dries quickly. It can withstand outdoor weather conditions very well, and even its colors don’t fade quickly. Many consider it the best material you can use for rope hanging chairs, except that it’s darn expensive. Quilted hammock chairs, but also even those ones that are not quilted, provide greater cushioning than the rope versions, so they’re more comfortable. Often you have several layers of fabric, and there’s also greater support than with rope hanging chairs. You’re more like to enjoy spending hours on this kind of hanging chair, which does help when you’re trying to enjoy a whole novel or an entire season of your favorite TV show. It’s very cushy, on account of the layers of fabric it uses. There’s also no rope or cord that feels like it’s cutting into your skin. So in a way it feels like you’re sitting on a cocoon-like chair that cradles you comfortably while it also lets you swing in different directions. Since there aren’t any holes, you don’t have to worry about getting your fingers caught. On the other hand, this style may feel a bit warmer since may keep the air from passing through the fabrics. Also, with style you have it worse when you spill drinks while you’re sitting. The same thing is true when you’re wet after taking a dip on the beach or in the pool. The fabric will absorb the liquid spill or drops of water, and then it will get wet and maybe even stain. Many types of fabrics can be used for this kind of hammock chair. Aside from the materials for rope hanging chairs we’ve already mentioned, there are some other possibilities. Textilene. This is a special kind of polyester mesh coated with PVC. It is non-stretch, flame-retardant, resistant to mildew, and stable even under hot or cold conditions. This is extremely durable and doesn’t need much maintenance. The colors of the fabric can last for years outdoors. Dyed acrylic. This is a very tough fabric and it’s expressly suitable for outdoor use. It has a feel that’s similar to soft cotton, and it’s breathable too. It’s great when it’s dyed because it can keep its colors from, fading for a very long time. It’s also great for poolside use because it can be used even in water. It’s also resistant to mildew. Sunbrela. This is a special line of proprietary fabrics which can be used for hammock swings too. It’s expensive, but the features are often worth the expense. They can be as soft as cotton. They endure outdoors regardless of the weather conditions, and they’re also resistant to mildew and mold. The colors on the fabric also last for a very long time. The macrame is an ancient tradition that originally came to us from the Orient. Macramé can be used to make bags or belts, decorative wall hangings, but also the hanging macrame hammock chairs are totally trendy. Th his type of hammock is actually very expensive. But with a bit of craftsmanship, something like this can be done easily by yourself. If you’re looking for a more detailed guide, you’ll find it here. How durable they are, is depending on the material they made of. What models are durable outdoors? First, you need to check the weight capacity. 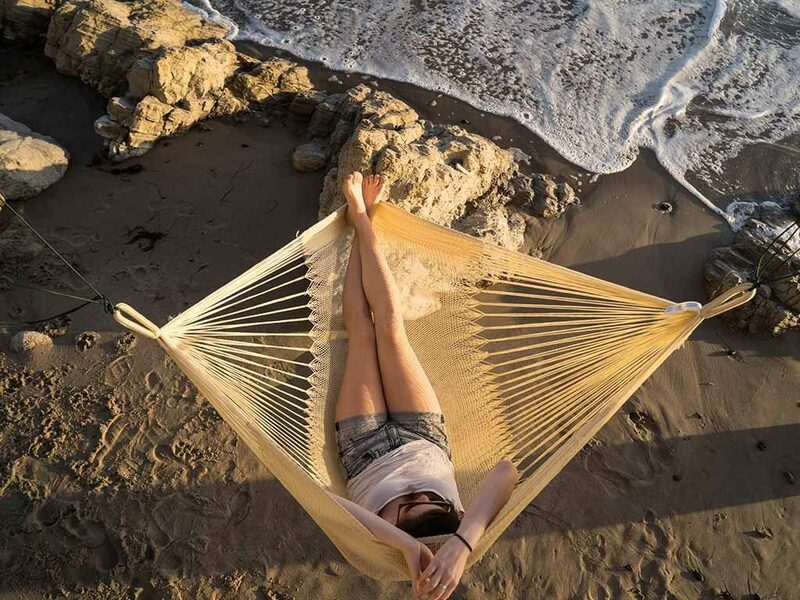 It stands to reason that a hammock swing that’s rated to accommodate 500 pounds of weight is tougher (and therefore more durable) than its counterpart that’s only able to hold 200 pounds. Then you need to check the fabric used. Cotton and real rattan are not really all that strong, especially when you compare it to many modern synthetic materials. DuraCord and synthetic rattan are especially durable. You also have to find out what kinds of materials are used for the spreader bars and for the stands. That goes for the hanging accessories as well. You should also check for features specifically for outdoor use. The hammock seat should be water resistant, especially if you’re going to use it by the pool or if you’re going to leave it outside during the rainy season. Check if the colors are supposed to last for a very long while. Some fabrics can keep their colors from fading or bleaching. Can it handle kids? Kids can be very imaginative when they’re hell-bent on destruction. Can it handle pets? If you have pets, make sure that the hammock swing can withstand nail scratches and bouts of gnawing. Some of these hammock swings are even designed to carry pets too, so your pet dog can cuddle with you while you’re sitting. You should find out how long the warranty is, as well as the quality of the customer support. Generally, a longer warranty denotes a more durable hanging chair. But that won’t matter if the customer support doesn’t really act on its warranty promises. Read the reviews, especially the updated ones. You may find rave reviews have been updated with additional complaints about how the hammock swing didn’t last for long. How to Hang the Chair Outside? Who has a big sturdy tree with a thick and strong branch in the garden, saves a lot of money. A hanging chair frame for the garden is, of course, a bit more expensive, but brings a lot of flexibility. So you can always put the hanging chair in the sun or in the shade, wherever you like to. Frames made of weatherproof treated wood (e.g. impregnated spruce, larch or ash) are particularly suitable. But no matter how weatherproof your frame is: please take it to a dy place during winter! Suspending a hanging chair from a sturdy branch is easy, requires no drilling and is cheap. But first, you should check if the branch is really stable enough. Unfortunately, we can’t make any statements about the required branch thickness, because it depends on the type and age of the tree. If you are worried about the sturdiness of the tree, you can either support the tree with a scissors support or divide the weight of the hanging chair evenly over several branches using a clever rope construction. A hanging chair frame is suitable for attaching a hanging chair if it cannot be attached to the ceiling of a room (for various reasons), or if you simply want to make the hanging chair a little more flexible and do not always want to have it in the same place. Handing chair stands are available either in metal or wood and from various brands, as well as some inexpensive models from no-name suppliers. Find a shady spot for the hanging chai No matter of which material is made, it will last longer. When its winter time and you know you’re not really going to be using the hammock swing, disassemble it and then store it away in a dry place. Make sure that it’s an area where bugs and rodents can’t get at it. Take care of the rope by cleaning it regularly. You can just use a scrub brush with soft bristles, plus some warm soapy water. Don’t worry if it’s a cotton rope and it shrinks, as it will stretch again when you use it. The wooden hanging chairs or even small wooden parts, like the spread bar for hammock chair, will benefit from refinishing from time to time. Just don’t detach the spreader bar from the chair. Leave them all tied together and just work around the rope. So buy a good hanging chair, out it up in a good place, and take care of it properly. It should give you a great spot to relax in for years to come!